Some things are a lot easier to move than others, and unfortunately, there's nothing easy about getting a hot tub from one place to another. The hassle makes a lot of people choose to sell or leave a jacuzzi behind for the next tenant or homebuyer. But if you're attached to yours, it's not impossible if you've got the right equipment and enough people to do the job. I think it's better to hire professionals for this -- especially companies that specialize in moving large or irregular-sized items -- but even if you do it's better to know how to move a hot tub so things go more smoothly. The first things should be pretty obvious, but I'll tell you anyways because I'd hate to see you get into an accidents: Unplug the electrical cord, secure it underneath the hot tub within the compartment designated for that purpose, and make sure the motor remains secure. Then drain the hot tub of all water, replace the cap afterward, and let the whole thing dry out. You're going to need to have a few things on hand for the rest of the move. First, get foam or clear plastic to wrap the entire thing in, to prevent damage to the exterior while moving. I think you should also have cardboard to put around all of the electrical components located in the back of the whirpool bath. Then, you're going to need a pallet or other platform with wheels on it, because a hot tub's just too heavy to carry all the way. Finally, you're going to have to find friends to help you. 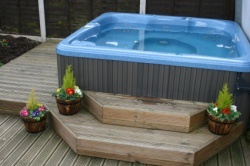 You and your friends have to lift the hot tub onto the dolly, pallet or other wheeled platform. If you're shorthanded or find the tub's heavier than you can handle, you can improvise: create a ramp out of a piece of plywood, immobilize your dolly or pallet and then push the tub up the ramp – you'll be able to use it later when transporting the tub from the pallet or dolly to the moving truck. Then use some of the leftover foam or clear plastic to wrap or otherwise secure the tub to the surface of your little wheeled vehicle. Wheel the tub over to the moving truck and very carefully unload. Secure the jacuzzi in the cab of the truck so it doesn't move around during transport. When you arrive at your destination, do the reverse of everything I just mentioned up to now. That includes filling the jacuzzi with water. I think you'll be in the mood to use the hot tub after doing all that moving. Best of luck with your move.